UNBOXING VIDEO: B&W introduces P3 portable headphones | What Hi-Fi? 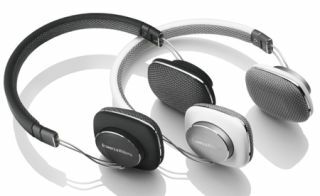 Bowers & Wilkins has expanded its product line-up with the introduction of the P3 on-ear headphones at £170. Bearing a strong resemblance to the company’s established P5s, these new headphones are even more focused on portable use. They’re considerably smaller and lighter than the older model, and are foldable too. As you'd expect from B&W there’s plenty of attention to detail here. Technically, great care has been taken to ensure the P3’s drive unit delivers low levels of distortion. The fabric for the ear pads is custom made for durability, comfort and acoustic transparency, while the use of ‘memory foam’ in the pads themselves makes things more comfortable for long-term use. The P3s come with a choice of cable leads; one with an iPhone remote/mic and another without, for use with other music players. There’s a choice of black or white finish, and the B&W P3s will cost £170 when they go on sale in June.